One of the oldest and most traditional of British herbal products. Established 1745. Langdale's Essence of Cinnamon contains only 100% natural ingredients with no added sugar or sweetener. Langdale's Essence of Cinnamon is a concentrated natural product that is Vegetarian Society approved. The warming aromatic qualities of cinnamon are blended with three natural herbs particularly useful during the times when the weather turns colder, and viruses are more virulent. Diluting 5ml in a warm drink can create a natural warming sensation ideal for when feeling cold and chilled. On this website you can find tips on how to use Langdale's Essence of Cinnamon as well as where to buy Langdale's in the UK and Ireland. 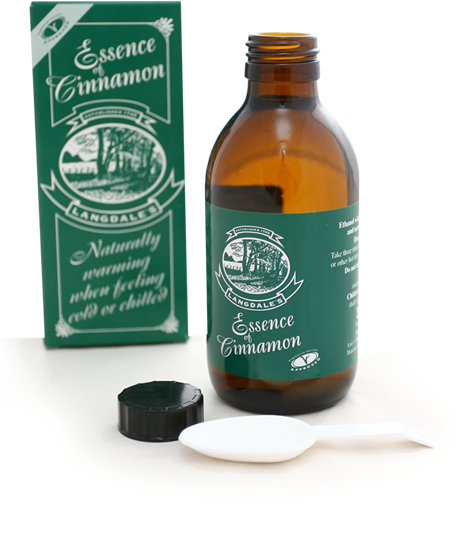 Langdale's Essence of Cinnamon has been used by generations of families since 1745. Have you tried it yet? If so, why not let us know your favourite way of taking it, or your favourite story about it. Contact Langdale's - we would love to get in touch! In February 1933 the British Journal of Nursing published an article with a reference to Langdale's Essence of Cinnamon. ... Mulled wine, added as your secret ingredient!